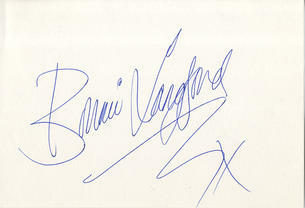 This is an In Person signed white card 6" x 4" by the English actress, dancer and singer. Bonita Melody Lysette "Bonnie" Langford (22 July 1964) is an English actress, dancer and entertainer. She came to prominence as a child star in the early 1970s then she subsequently became a companion of Colin Baker and Sylvester McCoy's Doctor Who and has appeared on stage in various musicals such as Peter Pan: The Musical, Cats and The Pirates of Penzance. After a brief hiatus she has returned to screen and stage following her acclaimed performances on celebrity talent show Dancing on Ice. In 2009 Bonnie relocated to the United States, and now divides her time between New York and the United Kingdom.